The First Opium War (Chinese: 第一次鴉片戰爭; pinyin: Dìyī cì Yāpiàn Zhànzhēng), also known as the Opium War or the Anglo-Chinese War, was a series of military engagements fought between the United Kingdom and the Qing dynasty of China over diplomatic relations, trade, and the administration of justice in China. 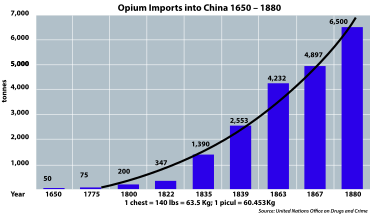 Trade benefited after the newly-risen Qing dynasty relaxed maritime trade restrictions in the 1680s. Taiwan came under Qing control in 1683 and rhetoric regarding the tributary status of Europeans was muted. Guangzhou (known as Canton to Europeans) became the port of preference for incoming foreign trade. Ships did try to call at other ports, but these locations could not match the benefits of Canton's geographic position at the mouth of the Pearl River, nor did they have the city's long experience in balancing the demands of Beijing with those of Chinese and foreign merchants. From 1700 onward Canton was the center of maritime trade with China, and this market process was gradually formulated by Qing authorities into the "Canton System". From the system's inception in 1757, trading in China was extremely lucrative for European and Chinese merchants alike as goods such as tea, porcelain, and silk were valued highly enough in Europe to justify the expenses of traveling to Asia. The system was highly regulated by the Qing government. Foreign traders were only permitted to do business through a body of Chinese merchants known as the Cohong and were forbidden to learn Chinese. Foreigners could only live in one of the Thirteen Factories and were not allowed to enter or trade in any other part of China. Only low level government officials could be dealt with, and the imperial court could not be lobbied for any reason excepting official diplomatic missions. The Imperial laws that upheld the system were collectively known as the Prevention Barbarian Ordinances (防範外夷規條). The Cohong were particularly powerful in the Old China Trade, as they were tasked with appraising the value of foreign products, purchasing or rebuffing said imports, and charged with selling Chinese exports at an appropriate price. The Cohong was made up of between (depending on the politics of Canton) 6 to 20 merchant families. Most of the merchant houses these families ruled had been established by low-ranking mandarins, but several were Cantonese or Han in origin. Another key function of the Cohong was the traditional bond signed between a Cohong member and a foreign merchant. This bond stated that the receiving Cohong member was responsible for the foreign merchant's behavior and cargo while in China. In addition to dealing with the Cohong, European merchants were required to pay customs fees, measurement duties, provide gifts, and hire navigators. Calls for military action were met with mixed responses when the matter went before Parliament. Foreign Secretary Palmerston, a politician known for his aggressive foreign policy and advocacy for free trade, led the pro war camp. Palmerston strongly believed that the destroyed opium should be considered property, not contraband, and as such reparations had to be made for its destruction. He justified military action by saying that no one could "say that he honestly believed the motive of the Chinese Government to have been the promotion of moral habits" and that the war was being fought to stem China's balance of payments deficit. After consulting with William Jardine, the foreign secretary drafted a letter to Prime Minister William Melbourne calling for a military response. 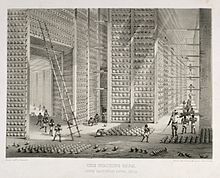 Other merchants called for an opening of free trade with China, and it was commonly cited that the Chinese consumers were the driving factor of the opium trade. The periodic expulsion of British merchants from Canton and the refusal of the Qing government to treat Britain as a diplomatic equal were seen as a slight to national pride. Few Tory or liberal politicians supported the war. Sir James Graham, Lord Phillip Stanhope, and future Prime Minister William Ewart Gladstone headed the anti-war faction in Britain, and denounced the ethics of the opium trade. After three days of debate, the vote was taken on Graham's motion on 9 April 1840, which was defeated by a majority of only 9 votes (262 votes for vs 271 votes against ). The Tories in the House of Commons thus failed to deter the Government from proceeding with the war and stop the British warships already on their way to China. A similar motion moved by Earl Stanhope in the House of Lords on 12 May 1840 also failed to pass. The House of Commons finally agreed on 27 July 1840 to a resolution of granting £173,442 for the expenses of the expedition to China, long after the war with China had broken out. Under strong pressure and lobbying from various trade and manufacturer associations, the Whig cabinet under Prime Minister Melbourne decided on 1 October 1839 to send an expedition to China. War preparations then began. Left without a major base of operations in China, the British withdrew their merchant shipping from the region while maintaining the Royal Navy's China squadron in the islands around the mouth of the Pearl River. From London, Palmerston continued to dictate operations in China, ordering the East India Company to divert troops from India in preparation for a limited war against the Chinese. It was decided that the war would not be fought as a full-scale conflict, but rather as a punitive expedition. Superintendent Elliot remained in charge of Britain's interests in China, while Commodore James Bremer led the Royal Marines and the China Squadron. Major General Hugh Gough was selected to command the British land forces, and was promoted to overall commander of British forces in China. The cost of the war would be paid by the British Government. Per Lord Palmerston's letter, plans were drawn up by the British to launch a series of attacks on Chinese ports and rivers. British plans to form an expeditionary were started immediately after the January 1840 vote. Several infantry regiments were raised in the British isles, and the completion of ships already under construction was expedited. To conduct the upcoming war, Britain also began to draw on forces from its overseas empire. British India had been preparing for a war since word had arrived that the opium had been destroyed, and several regiments of Bengali volunteers had been recruited to supplement the regular British Indian Army and East India Company forces. 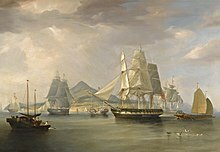 In terms of naval forces, the ships earmarked for the expedition were either posted in remote colonies or under repair, and Oriental Crisis of 1840 (and the resulting risk of war between Britain, France, and the Ottoman Empire over Syria) drew the attention of the Royal Navy's European fleets away from China. Orders were dispatched to British South Africa and Australia to send ships to Singapore, the assigned rendezvous point for the expedition. A number of steamers were purchased by the Royal Navy and attached to the expedition as transports. The unseasonable summer weather of India and the Strait of Malacca slowed the British deployment, and a number of accidents decreased the combat readiness of the expedition. Most notably, both of the 74-gun ships of the line that the Royal Navy intended to use against Chinese fortifications were temporarily put out of action by hull damage. Despite these delays, by mid-June 1840 British forces had begun to assemble in Singapore. While they waited for more ships to arrive, the Royal Marines practiced amphibious invasions on the beach, first by landing ashore in boats, then forming lines and advancing on mock fortifications. In late June 1840 the first part of the expeditionary force arrived in China aboard 15 barracks ships, four steam-powered gunboats and 25 smaller boats. The flotilla was under the command of Commodore Bremer. The British issued an ultimatum demanding the Qing Government pay compensation for losses suffered from interrupted trade and the destruction of opium, but were rebuffed by the Qing authorities in Canton. 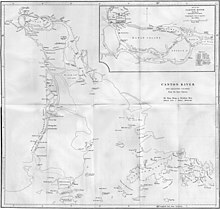 In his letters, Palmerston had instructed the joint plenipotentiaries Elliot and his cousin Admiral George Elliot to acquire the cession of at least one island for trade on the Chinese coast. With the British expeditionary force now in place, a combined naval and ground assault was launched on the Chusan Archipelago. Zhoushan Island, the largest and best defended of the islands was the primary target for the attack, as was its vital port of Dinghai. When the British fleet arrived off of Zhoushan, Elliot demanded the city surrender. The commander of the Chinese garrison refused the command, stating that he could not surrender and questioning what reason the British had for harassing Dinghai, as they had been driven out of Canton. Fighting began, a fleet of 12 small junks were destroyed by the Royal navy, and British marines captured the hills to the south of the Dinghai. The British captured the city itself after an intense naval bombardment on 5 July forced the surviving Chinese defenders to withdraw. The British occupied Dinghai harbor and prepared to use it as a staging point for operations in China. In the fall of 1840 disease broke out in the Dinghai garrison, forcing the British to evacuate soldiers to Manila and Calcutta. By the beginning of 1841 only 1900 of the 3300 men who had originally occupied Dinghai were left, with many of those remaining incapable of fighting. An estimated 500 British soldiers died from disease, with the Cameron and Bengali volunteers suffering the most deaths, while the Royal Marines were relatively unscathed. Having captured Dinghai, the British expedition divided its forces, sending one fleet south to the Pearl River while sending a second fleet north to the Yellow Sea. The northern fleet sailed to Peiho, where Elliot personally presented Palmerston's letter to the Emperor to Qing authorities from the capital. 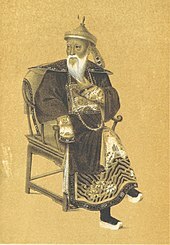 Qishan (ᡴᡳᡧᠠᠨ), a high-ranking Manchu official, was selected by the Imperial Court to replace Lin as the Viceroy of Liangguang after the latter was discharged for his failure to resolve the opium situation. Negotiations began between the two sides, with Qishan serving as the primary negotiator for the Qing and Elliot serving as the representative for the British Crown. After a week of negotiations, Qishan and Elliot agreed to relocate to the Pearl River for further negotiations. 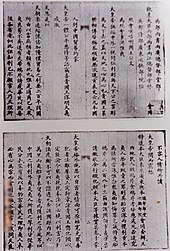 In return for the courtesy of the British to withdraw from the Yellow Sea, Qishan promised to requisition imperial funds as restitution for British merchants who had suffered damages. The war, however, was not concluded and both sides continued to engage each other. In the late spring of 1841 reinforcements arrived from India in preparation for an offensive against Canton. A flotilla of transports brought 600 men of the professionally-trained 37th Madras Native Infantry to Dinghai, where their arrival boosted British morale. Accompanying the fleet as far as Macau was the newly constructed iron steamer HMS Nemesis, a weapon to which the Chinese navy had no effective counter. On 19 August three British warships and 380 marines drove the Chinese from the land bridge (known as "The Barrier") separating Macau from the Chinese mainland. The defeat of the Qing soldiers coupled with the arrival of the Nemesis in Macau's harbor resulted in a wave of pro-British support in the city, and several Qing officials were driven out or killed. Portugal remained neutral in the conflict, but after the battle was willing to allow British ships to dock in Macau, a decision that granted the British a functioning port in Southern China. With the strategic harbors of Dinghai and Macau secured, the British began to focus on the war on the Pearl River. Five months after the British victory at Chusan, the northern elements of the expedition sailed south to Humen, known to the British as The Bogue. Bremer judged that gaining control of the Pearl River and Canton would put the British in a strong negotiating position with the Qing authorities, as well as allow for the renewal of trade when the war ended. While the British campaigned in the north, Qing Admiral Guan Tianpei greatly reinforced the Qing positions in Humen (Bocca Tigris), suspecting (sources state that Guan had been preparing for an eventual attack on the position since Napier's attack in 1835) that the British would attempt to force their way up the Pearl River to Canton. The Humen forts blocked transit of the river, and were garrisoned with 3000 men and 306 cannon. By the time the British fleet was ready for action, 10000 Qing soldiers were in position to defend Canton and the surrounding area. The British fleet arrived in early January, and began to bombard the Qing defenses at Chuenpi after a group of Chinese fire-rafts were sent drifting towards the Royal navy ships. On 7 January 1841 the British won a decisive victory in the Second Battle of Chuenpi, destroying 11 Junks of the Chinese southern fleet and capturing the Humen forts. The victory allowed the British to set up a blockade of The Bogue, a blow that forced the Qing navy to retreat upriver. The brief interlude in the fighting ended in the beginning of February after the Chinese refused to reopen Canton to British trade. On 19 February a longboat from HMS Nemesis came under fire from a fort on North Wangtong Island, prompting a British response. The British commanders ordered another blockade of the Pearl River and resumed combat operations against the Chinese. The British captured the remaining Bogue forts on 26 February during the Battle of the Bogue and the Battle of First Bar on the following day, allowing the fleet to move further upriver towards Canton. Admiral Tianpei was killed in action during the fighting on 26 February. On 2 March the British destroyed a Qing fort near Pazhou and captured Whampoa, an action that directly threatened Canton's east flank. Major General Gough, who had recently arrived from Madras aboard HMS Cruizer, personally directed the attack on Whampoa. Superintendent Elliot (who was unaware that he had been dismissed), and the Governor-General of Canton declared a 3-day truce on 3 March. Between the 3rd and the 6th the British forces that had evacuated Chusan per the Convention of Chuenpi arrived in the Pearl River. The Chinese military was likewise reinforced, and by 16 March General Yang Fang commanded 30,000 men in the area surrounding Canton. While the main British fleet prepared to sail up the Pearl River to Canton, a group of three warships departed for the Xi River estuary, intending to navigate the waterway between Macau and Canton. The fleet, led by Captain James Scott and Superintendent Elliot, was composed of the frigate HMS Samarang and the steamships HMS Nemesis and HMS Atalanta. Although the waterway was in places only 6 feet deep, the shallow drafts of the steamships allowed the British to approach Canton from a direction the Qing believed to be impossible. In a series of engagements along the river from March 13-15th, the British captured or destroyed Chinese ships, guns, and military equipment. 9 junks, 6 fortresses, and 105 guns were destroyed or captured in what was known as the Broadway expedition. With the Pearl River cleared of Chinese defenses, the British debated advancing on Canton. Although the truce had ended on 6 March, Superintendent Elliot believed that the British should negotiate with the Qing authorities from their current position of strength rather than risk a battle in Canton. The Qing army made no aggressive moves against the British and instead began to fortify the city. Chinese military engineers began to establish a number of mud earthworks on the riverbank, sank junks to create riverblocks, and started constructing fire rafts and gunboats. 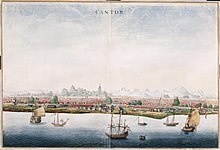 Chinese merchants were ordered to remove all of the silk and tea from Canton to impede trade, and the local populace was barred from selling food to the British ships on the river. 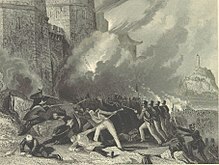 On 16 March a British ship approaching a Chinese fort under a flag of truce was fired upon, leading to the British setting the fort on fire with rockets. These actions convinced Elliot that the Chinese were preparing to fight, and following the return of the ships of the Broadway expedition to the fleet, the British attacked Canton on 18 March, taking the Thirteen Factories with very few casualties and raising the Union Jack above the British factory. The city was partially occupied by the British and trade was reopened after negotiation with the Cohong merchants. After several days of further military successes, British forces commanded the high ground around Canton. Another truce was declared on 20 March. Against the advice of some of his captains, Elliot withdrew most of the Royal Navy warships downriver to the Bocca Tigris. The defense of Canton was declared a diplomatic success by Yishan. In a letter to the Emperor, he wrote that the barbarians had begged "the chief general that he would implore the great Emperor in their behalf, that he would have mercy upon them, and cause their debts to be repaid them, and graciously permit them to carry on their commerce, when they would immediately withdraw their ships from the Bocca Tigris, and never dare again to raise any disturbance." However, General Yang Fang was reprimanded by the Emperor for his agreeing to a truce rather than forcefully resisting the British. The Emperor was not informed the British expedition had not been defeated and was very much intact. The imperial court continued to debate China's next course of action for the war, as the Daoguang Emperor wanted Hong Kong retaken. Following their withdraw from Canton, the British relocated the expeditionary force to Hong Kong. Just as with the Chinese commanders, the British leaders debated how the war should be continued. Elliot wanted to cease military operations and reopen trade, while Major General Gough wanted to capture the city of Amoy and blockade the Yangtze River. In July a typhoon struck Hong Kong, damaging British ships in the harbor and destroying some of the facilities the expedition was building on the island. The situation changed when on 29 July Elliot was informed that he had been replaced as Superintendent by Henry Pottinger, who arrived in Hong Kong on 10 August to begin his administration. Pottinger wanted to negotiate terms with the Qing for the entire country of China, rather than just the Pearl River, and so he turned away Chinese envoys from Canton and gave permission for the expeditionary force to proceed with its war plans. Admiral Sir William Parker also arrived in Hong Kong to replace Humphrey Fleming Senhouse (who had died of a fever on 29 June) as the commander of the British naval forces in China. It was agreed by the British commanders that combat operations should be moved north to put pressure on Peking, and on 21 August the fleet sailed for Amoy. On 10 October a British naval force bombarded and captured a fort on the outskirts of Ningbo in central China. A battle broke out between the British army and a Chinese force of 1500 men on the road between the town of Chinhai and Ningbo, during which the Chinese were routed. Following the defeat, Chinese authorities evacuated Ningbo and the empty city was taken by the British on 13 October. An imperial cannon manufactory in the city was captured by the British, reducing the ability of the Qing to replace their lost equipment, and the fall of the city threatened the nearby Qiantang River. The capture of Ningbo forced the British command to examine their policy towards occupied Chinese territory and prizes of war. Admiral Parker and Superintendent Pottinger wanted a percentage of all captured Chinese property to be turned over to the British as legal prizes of war, while General Gough argued that this would only turn the Chinese population against the British, and that if property had to be seized, it should be public property rather than private. British policy eventual settled that 10% of all property captured by the British expeditionary forces would be seized as war loot in retaliation for injustices done to British merchants. Gough later stated that this edict would compel his men to "punish one set of robbers for the benefit of another." With many Chinese ports now blockaded or under British occupation, Major General Gough sought to cripple the finances of the Qing Empire by striking up the Yangtze River. 25 warships and 10,000 men were assembled at Ningpo and Zhapu in May for a planned advance into the Chinese interior. The expedition's advance ships sailed up the Yangtze and captured the emperor's tax barges, a devastating blow that slashed the revenue of the imperial court in Beijing to just a fraction of what it had been. This page is based on the Wikipedia article First Opium War; it is used under the Creative Commons Attribution-ShareAlike 3.0 Unported License (CC-BY-SA). You may redistribute it, verbatim or modified, providing that you comply with the terms of the CC-BY-SA.